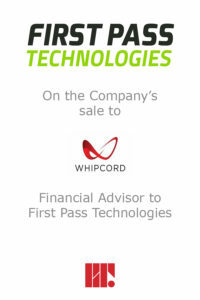 Redcap&Truss acted as exclusive financial advisor to the shareholders of First Pass Technologies (“First Pass”) on the sale of its business to Whipcord Corporation. (“Whipcord”). First Pass, founded by Ian Coutts and Lane Story, provides route optimization software for agricultural implements, improving implement organization while reducing the distance travelled, input costs and labor costs. Whipcord is a high-performance technology company that is focused on empowering the digital transformation of agriculture through platform, software and infrastructure services. This transaction provides First Pass with the ability to continue their rapid expansion while utilizing the expertise of an established IT company to better serve customers. Together the combined company aims to become a leader in the digital transformation of agriculture by enabling farmers, suppliers and participants to grow their businesses through the utilization of insights gained from their data. “After meeting with Redcap&Truss for the first time in June, they immediately identified options that could help us take our company to the next level. I am incredibly excited about the future of First Pass and Whipcord. Together, we have the opportunity to create value for agriculture stakeholders with new digital products” says Matt Coutts, CEO, First Pass Technologies.